What happened to his promise to "guard and protect the flock"? The context of Brunson's statement above had to deal with those in church who "create upset" and "raise controversies". He said the church is to have nothing to do with them, to leave them alone. I guess that doesn't apply to his friends, however. I have confirmed from a reliable source that FBC Jax church leaders have decided to bring in Ergun Caner to speak to the FBC Jax high schoolers' and middle schoolers' at their summer youth camp that will be held August 1st-5th at the Georgia Baptist Convention's Norman Park Conference Center in Tifton, GA. But they must not want many people to know, as his presence at the camp is not highlighted on their camp info web page. Strange, you bring in a big name like Caner, and no mention of it anywhere. Brunson told his congregation on May 1st he is to "guard and protect this body" ...but where is the protection of the young people from an unrepentant fib-teller in the pulpit who uses racial and gender stereotypes in his speaking? Of all possible special speakers to come in and preach to th e young skulls of mush, why Caner? Caner still has not publicly apologized and repented for his decade of deceit - including his lies spoken to FBC Jax in November 2001 when he portrayed himself as a former terrorist raised in Europe, trained in Jihad to commit 9/11 attacks - when in fact he was raised in the 'burbs of Columbus, Ohio since the age of two. Is Caner the best example of integrity and truth that First Baptist can find for their young people? Of course not....but Caner is good friends with Pastor Mac Brunson, and Ergun Caner and Mac are co-authors of a book that they have been working together on for a second edition. So at FBC Jax these days, it sure seems that a personal and business relationship with the pastor trumps the need to find the best role model for kids at camp. Bringing in the pastor's buddy and co-author for a speaking gig trumps his "guarding and protecting" the flock, apparently. One of the problems SBC and other evangelicals have with youth is the rate at which they are leaving church and abandoning their faith once they leave home. Teenagers question everything, and they haven't drunk the baptist Kool Aid for decades like most of their parents. Once they become aware of Caner's antics shortly after 9/11, his efforts to recreate himself from E. Michael Caner to Ergun Mehmet Giovianni Caner the trained terrorist from Turkey, how he duped our own Marines preparing for battle, when they realize great "men of God" refused to hold Caner accountable they will wonder why this man has not repented of this publicly as they are taught in church. They will wonder why their pastor and youth directors allowed an Ergun Caner the privilege of speaking to them rather than an Anthony George, or a Calvin Carr or a myriad of other ministers. They will wonder why their lay leaders didn't stop it. They will wonder why supposed great "men of God" didn't hold Caner accountable and still propped up his celebrity status while he hasn't publicly repented. And the answers to their questions, the conclusions to which they come, will potentially cause great harm to the kids' faith and to the body of Christ. I hope at least some of the parents of middle schoolers and high schoolers at FBC Jax are disgusted at this choice for their young people. I hope the lay workers at FBC Jax who work with these kids are disgusted. They work so hard all year to instill values of truth and honesty in the kids, and their professional seminarian church leaders go and bring in Caner to preach to their kids during the spiritual apex of the church year. Of course most young people at FBC Jax are not up on what has happened over the past year with Caner - they will eat up his stories, laugh at his jokes, and Caner will rebuild his brand with the next generation of FBC Jax'ers. Heck, at camp Ergun might slip in a story or two of his days growing up learning of American culture by watching Istanbul TV as a kid. Maybe he'll elaborate on his days of "Islamic Youth Jihad" and describe the training he received to perform 9/11 style attacks as he claimed at their church in November 2001. But maybe some good will come of this. Young people at FBC Jax, let this serve as a prime example for you that your church leaders - your senior pastor especially - don't always have the best interests of the people they are leading at heart. The pastor is not some sort of super-spiritual "man of God" like a priest or prophet who always knows best. Your pastor is not a "God-appointed agent to save you from your ignorance", as Al Mohler has claimed. Pastors are not to be blindly trusted. Your pastor claimed recently that his number one priority is to "guard the flock", yet I believe he is failing to guard you in this instance as he promises. Perhaps the Lord can use you to let your parents know, and your church leaders know that you aren't happy with this selection for your camp. And young people, this is a lesson for you of what NOT to do when you become a lay leader in your church. Don't be a "yes man" deacon or trustee or lay leader. Stand up to your pastor when they make a wrong decision such as this. You don't have to be silent and "let God handle it", or just say "well, Pastor is God's man"....no, YOU are God's man or woman at that church and maybe God wants YOU to speak up and demand accountability for a terrible decision such as this. Don't let the pastor convince you that you are sinning by raising this "controversial issue" and demanding that it be fixed. 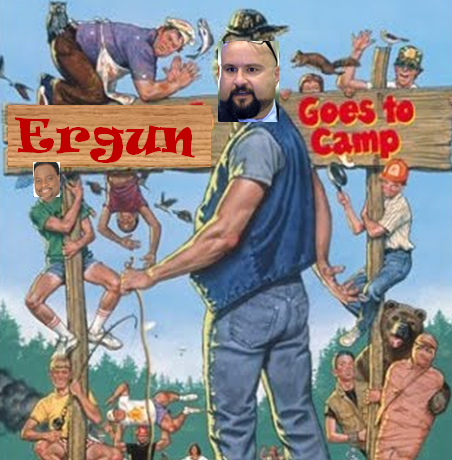 God has placed plenty of men and women in your church - including YOU - who should stand up to your pastor and say "No" to them bringing Ergun Caner to your camp. There still is time for FBC Jax and Mac Brunson to change their mind about bringing Caner to camp. If not, perhaps they can film the sessions with Caner and market it as "Ergun Goes to Camp". Heck, Tifton, GA is not too far away from Atlanta - why not call Eddie Long to come down and help out with camp and be a cabin chaperone for a group of 6th grade boys? Creflo Dollar can come down too. Over and under on how long it will take Jon Estes to say that Ergun Caner is an excellent choice for the young people at FBC Jax camp: 5 hours and 15 minutes. Place your bets. Based on Mac's comments at Norman Giesler's site, Mac is convinced Ergun Caner has repented of his sins. If Mac is convinced of Ergun's repentance, why don't they publicly invite Ergun Caner to FBC Jax for speaking engagements, instead of hiding his speaking engagements? Mac, needs to guard his flock from himself. Mac is his own worst enemy. Mac is guilty of nothing less than child abuse for doing this. The message to kids: Intentionally deceive, it's OK. Get caught, it's OK. Don't apologize, it's OK. You can still prosper. Especially in SBC positions. I thought Caner had a new job. These guys cannot live withut their speaking gigs for extra money. Exactly, the message is, don't read the blogs..."those nuts" you aren't supposed to be listening to. After all, you might find out who is coming to camp and what lies they've told. 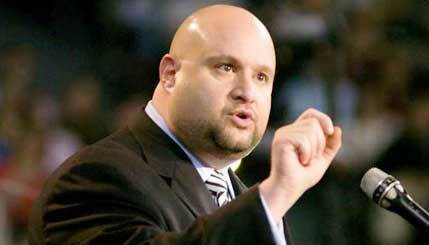 Ergun Caner is an excellent choice for a speaker in our culturally relevant churches. He’s a perfect example of today’s hip, popular, market savvy, purpose driven culture. The ends always justify the means now. Integrity is another old idea that’s not needed in the modern purpose driven church. Forget character, that’s old news. Just remember everyone, get what you can, can what you get, sit on the lid and poison the rest. First Baptist under the leadership of Mac Brunson continues it's downhill slide . . .tithing $$$$ spent for bringing in Ergun only means more people not giving for it to be spent on a liar. Mac has no shame - he believes he's top dog here in Jacksonville when the truth is he's not. This action will do nothing but make more members to quietly leave. "I know his grief over these recent events, his deep sorrow, and am confident that God will use this to fit him for greater service in the days to come." –Dr. Mac Brunson, Senior Pastor of First Baptist Church, Jacksonville, FL"
I thought Ergun did not do anything wrong and all these "factual statements that are self-contradictory" were just mistakes. However, from this statement it sounds like to me that Mac is stating that Ergun did something wrong, realizes he did something wrong and is sorry for his actions! So are we going to start hearing how he realizes the errors of his way and he repented and is now a "new man" so that he can start making the rounds and co-authoring books again? If you would take down the Ergun goes to Camp photoshop and the over the top suggestion that Eddie Long be considered as a counselor for 6th grade boys, this piece would be taken much more seriously. I realize that your Eddie Long suggestion was a joke, but Christian decency prohibits joking about sexual predation of minors, regardless of what point you are trying to make. "Let there be no filthiness nor foolish talk nor crude joking, which are out of place, but instead let there be thanksgiving" (Eph 5:4). Thank you for putting this front and center. When I found out a month-or-two ago that he was speaking (middle school pastor told me personally), I think I surprised him with my strong response. I told him that I wouldn't send my children to camp this year if Caner was the speaker. Sorry, I absolutely won't remove the Caner poster and the reference to Long. I'm making a serious point through parody. The point is where do church leaders draw the line between protecting their flocks and furthering the interests of themselves and their misbehaving friends? Creflo Dollar defended his friend Eddie Long, calling his sexual perversions a simple "wreck". Caner's defenders refuse to even admit that he lied - said he "misspoke". Other Anon - good for you in telling your youth minister how displeased you were at them bringing Caner in. I wouldn't send my kid either. I hope more people stand up against this. James - good points. I have not seen any of Caner's friends anywhere hint that Caner is remorseful, except for this statement by Brunson. But if Brunson realizes Caner did do wrong, and he did tell lies, then why doesn't Brunson require Caner to follow the advice that both men have in the book that they coauthored, that tells pastors that public sin requires public repentence? And some of Caner's first public statements after he was let go at Liberty last year were not that he had anything to repent of. He said that it would take more than disgruntled bloggers to take him down, and that bn. So none of it makes any sense. They can't even get their story straight, and they don't follow the basic principles in their own book! But kings make the rules for others, and they can live above them. I was at FBCDallas when Mac was here and know him from his time in the pulpit. I saw some questionable derision of people who did not toe the line on a buildling project. A bully pulpit if you will. It seems his ego driven methods have only increased. It's a good ol' boy network for sure in the SBC and to placate Ergun for this long is so replulsive. But worse, he insults the name and integrity of God Almighty with this conduct. In this public forum, I call on Mac Brunson to stop this gentle blasphemy of the Saviour's holy name and character. Mac, cease and desist from any more of this shenanigans right now. As a teacher and leader, you are held to a higher standard of conduct and judgement. Repent of all this before any more damage is done, place His commands as first in your thoughts and actions, please. Enough already with the Tiltons, Hinns, Swaggarts, Eddie Longs, Creflo Dollar types and the list goes on. Do not get yourself on such a list, where 'holy men of god' (so-called) are found to be in gross error. As a parent of a high schooler at FBC, I was very dismayed when I heard a couple of months ago that Caner was to be the speaker at camp. Our student will not be attending! I know that you are attempting to use parody by lumping in the pervert from Atlanta along with Caner, but frankly making any type of light about the parallel to Caner and Brunson is not cool. As a victim of sexual abuse this is extremely offensive and tasteless!!!! I commend your actions not to let your student not attend - the sad thing is that Caner is such a comedian and the youth will love him, such as our family did when we heard him speak several times. All that was prior to learning he had deceived us with lies. I am very disappointed that the leaders of FBCJ overlooked many many talented speakers and chose a man like Caner to represent our Youth. Shame on them! The center of the universe for those within the Baptist Mafia. I call it "dumb meeting dumb"
And then you have all those that "pay" for this circus. Dr. Caner repented. Our students need to learn that our great God Never Gives Up on Anyone!!!! He is a great example of what Paul said "I am forgetting the things behind me". It is awesome that our church is a part of Dr Caners rehab for Jesus. Our Kids are about to be blessed, Praise God!!!!! Not only WHEN did he repent, but WHAT did he repent of??? If he never lied, if all the videos are "edited", then WHAT in the world did he repent of? Is First Baptist better off now than we were 10 years ago? My kids have long graduated from High School, but I can tell you right now, there's no way they would be attending this camp !! I can't believe they are spending our hard-earned tithe money on Ergun Caner !! This is a slap in the face to the faithful members of FBC, and another excellent reason to give your money elsewhere. Off Topic: NYTN > YouTube Blogger 'NYTN' Gets DEATH THREAT for Creflo Dollar/Eddie Long Video! "Is First Baptist better off now than we were 10 years ago?" Come on all you people out there. NO CHURCH IS BETTER OFF THAN IT WAS TEN YEARS AGO. I guess all the pew sitters out there are blinded to the FACT that for the last ten to fifteen years there has been a GREAT falling away in ALL denominations in America. Anon 7:30 pm. You are absolutely correct. The real Christians have seen the organized church for what it is....money grabbers, $500 suits, fancy cars, big houses, big spenders. What I do not understand is how anyone buys into this fiasco! Stay home, read your Bible and help your family and those in need is the best any of us can really do. Paying someone else to tell us something we do not approve of is pure madness. Watchdog thanks for shining the light on things that seem to amaze the average Joe. However, since we are in the Last Days, End of Days nothing will really change. People hate to give up on amusements even if it does require 10% of their income. If you're gonna photoshop a face is tacky and tasteless manner, at least do a good job. "Read the writing on the wall". Alot of churches in the Jax area are alot better off today. North Jax, Fruit Cove, Hibernia, First Coast and Celebration are all building new buildings because they are GROWING instead of shrinking, unlike First Baptist where we have had to downsize the Auditorium because of low attendance, so low that on Wed. night they have moved back to the Ruth Lindsay Auditorium. They could even close parking garage 4 on Sunday morning and you would still have enough room to park the cars in garage 3. There use to be a saying around First Baptist years ago "A church alive is worth the drive". 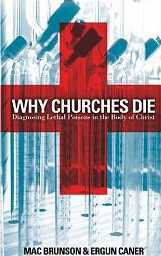 The sad part is when Dr. Lindsay died, First Baptist died. Dr. Vines was a good preacher but you could tell he loved the attention that was being given to him when he became the head Pastor and now we have a Preacher who is basking in the limelight. You would think a Preacher who has seen what First Baptist was and how the Pastors Conferances use to be packed out but now you can find plenty of seats during the Pastors Conferance would ask themselves what am I doing wrong where people are leaving and Pastors aren't coming that much to the conferance. But Mac Brunson thinks the problem is not him but the problem is US. Mac has surrounded himself with yes people who won't tell him that HE is the problem because they are scared of losing their job. Boy, what a way to run a church. Not as tasteless and tacky as having Caner to the FBC Jax camp to speak to the kiddos. A little humor about Yes-Men. A little humor about Religion. It's great to see all these comments whose tone is to stone the adulteress. I'm glad no one here has ever sinned and had to start all over again. Boy, what an imperfect blog this would be if we had actual sinners posting!!! I have read your blog, so-called FBC JAX Watchdog, and the most I see you do is cause dissension and sow hate. I pray for you and your family, because they are awfully sweet and I do love them. In conclusion, haters are going to hate. How touching...you love my sweet family. Yes, pray for my sweet family, having to live with a hater. Stone the adultress? What are you talking about anyway? "It's great to see all these comments whose tone is to stone the adulteress." So you are asserting that Ergun Caner is a spiritual whore? Tell me, Mom on the go, what do you teach your children? Do you teach them it’s ok to lie? Do you teach them it’s ok to lie as long as it achieves some perceived good purpose? When you catch them lying to you do you discipline them? What if they “repent” and “apologize” are they exempted from your discipline and consequences? I taught my child that you are never more like Satan than when you lie. "So you are asserting that Ergun Caner is a spiritual whore?" Aren't we all in some way or another? Thanks for asserting you want to stone others. This is funny. Ergun has no shame.